We help people over the full course of their lives, from the time they sustain a spinal cord injury through recovery and rehab to building a life of independence and choice. Our donors are absolutely crucial to the quality of that journey and every donation has a profound, personal impact. Please note: Canada Revenue Agency requires that the e-mail address entered must be that of the actual donor. This is a secure donation form and your credit card information will not be shared. 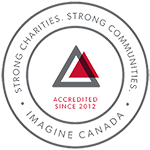 Accredited by Imagine Canada for excellence in nonprofit accountability, transparency and governance.